The Arab League headquarters in Jaffa and several other buildings are damaged by Jewish terrorists. MS. Men standing in a damaged archway. CU. & MS. Documents salvaged from the wreckage. LS. General view of the damaged building with lorry drawn up in front of it. Various long shots of the damage showing salvage and rescue work in progress. LS. Damaged roofs of buildings. CU. An armed Jewish sentry with another man. LS. More shots of damage with a member of the Haganah getting out of a jeep. Various shots of the officials from Barclay\'s bank, one of the damaged buildings, working with others amongst the wreckage. MS. British soldier climbs up a ladder, balanced against a damaged wall, while others look on. Summary. I hope the truce between Hamas and Fatah wil hold. The only one who profits from fighting between Palestinians is Israel. And it is so bad for the children who now are frightened also of other Palestinians and not only of the Israeli army. And about the attack in Eilat. Always I say I’m against attacks on civilians. But we have to understand what happens to people when they have no hope, and no place where they can get their rights. People in Israel still believe they are fighting for their lives. I quote a survivor from the holocaust, who is afraid that Ahmadinejad will be able to destroy the jews. People in Israel, who have strong memories about what happened in Europe tend to forget that then they where a helpless minority. Now they have a state with an army, and the VS to back them up. It is difficult for people to see that they changed from being victims to being perpetrators, and that the resistance against Israel has nothing to do with antisemitism. Often we hear: they want to drive us jews into the sea. 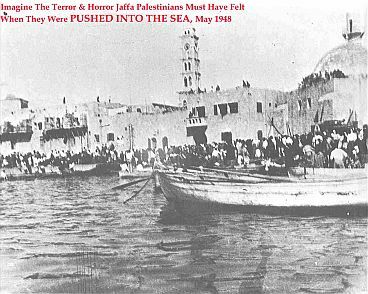 When actually it was the Palestinians who were driven into the sea. 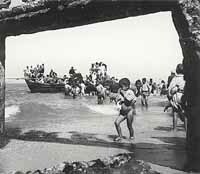 I show some historical pictures of Jaffa in 1948. Ilan Pappe, the historian who visited the Netherlands what happened before and after 1948 ‘ethnic cleansing’, and it is a crime against humanity. It should at least be acknowledged, as all colonialist states had to acknowledge what they have done to native peoples. And if some people have hopes for a new and better president of the US, Hilary Clinton will not be of any help. She already said she is a friend of Israel.